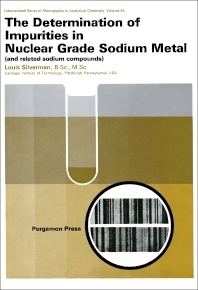 International Series of Monographs in Analytical Chemistry, Volume 44: The Determination of Impurities in Nuclear Grade Sodium Metal (and Related Sodium Compounds) provides analytical chemical procedures for the determination of impurities in nuclear grade sodium metal. This book is composed of 25 chapters, and begins with a presentation of the methods for dissolving, bulk separation, sampling, and handling of sodium metal. The rest of the book describes the procedures for impurity determination in nuclear grade sodium metals, including aluminum, bismuth, boron, cadmium, calcium, magnesium, carbon, cesium, and chloride. Other impurities considered include chromium, cobalt, copper, hydrogen, iodine, iron, lead, lithium, manganese, nickel, oxide, oxygen, and phosphorus. The last chapters examine the procedures for determination of potassium, silicon, sulfur, and uranium impurities. This book is of value to analytical and inorganic chemists.